Jack is an older intact boy, and he's not aggressive but has absolutely NO ratiquette and sees a rat and pounces. The victim gets pounced on, pinned and stood on...which terrifies most of them LOL. Jack is completely oblivious to this of course. When Jack arrived, I just let him run with the bedrats (oldies/sickies) and he was soo happy and was "okay" with them. When I had to cage him up with said rats things got a bit less Okay though. My old feral boy Otter was thrilled when Jack left LOL. My friend couldn't find any friends for Jack, and couldn't have him out like I could, so she asked me if I would be willing to take him on. We found out recently that his former owner let him run 24/7 and he never had rat friends. Its hard to explain about Jack, he's wonderful. He runs and is incredibly happy, which makes everyone around him happy (he's just contagious). He plays, he cuddles, he licks, he loves people, and food and observing things from everywhere he can. He bounces up to me, then sledges around on his belly until he's curled around my neck, and then I stroke him or rub him...both much enjoyed. As long as I do that he will stay forever. 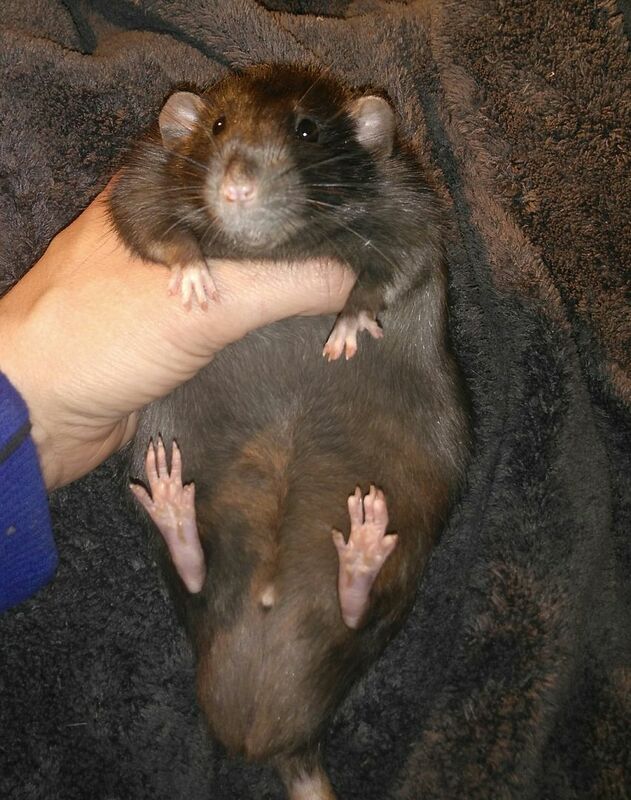 He loves to be picked up and smooshed and he's a bit chubby right now (not much longer though if he keeps running and exercising like he is now). He is very polite too, coming to visit me in the middle of the night, and since I am a light sleeper who shifts and turns a lot because of a bad back, I can wake up and pat him, then go to sleep again with no problem. He also does NOT chew. its almost weird. He can have cables alll over him and he has no inclination at all. and we have our first story. Jack came to see me about 5 am, he slinks up around my neck and very gently pokes my face with his nose. "You awake?? Pat me" LOL. I oblige and he's thrilled but then I turn on my other side, and he ends up propped up in the blankets partially on his back. He's got a big chubby black self belly that I just had to stroke. He ended up sprawled out totally on his back, with his paws limp and his head thrown back. When I was rubbing his head with my fingers but then stopped he grabbed my finger in both paws and just held it. Awwww. Oh Jack, you are such a handsome fellow!! Oh, what a sweetheart! I'm glad he came to fill some of the gap from Pele's passing. Sounds like he's just what the doctor ordered! Way to go blackJack! I know what you mean about rats from gentle environments being overwhelmed by newly incomiing exuberance and being relieved when it ends. Glad you found his special gifts fast. Oh, he looks like a real sweetheart! I bet Pele sent him to look after you. I read a story once about how rats are angels who aren't allowed to stay on Earth very long (which is why their lives are so short), and when they have to go back to heaven they tell the new angels coming down which people to look for. That's why I'm so sure Pele had a hand in Jack's arrival. he's so cute -- and I love his whiskers! He's so fun and gorgeous! I love BigBen's story, too! Not only totally pokeable belly and hobbity feet and bright, smart eyes, but may I add rather impressive torpedoes LOL.